Garbage on the Green (GoG) is a wasteauditing program developed by the UNF Environmental Center in 2007 with support from Physical Facilities. The audit was designed to gain a better understanding of UNF’s solid waste stream and to improve the University’s overall diversion rate. The program corresponds with UNF’s plan to reduce its overall environmental impact. It includes a morning litter cleanup and an afternoon waste audit. This year’s event partnered with UNF Volunteer Services and was held in conjunction with the Volunteer Fair. The program is aimed at helping UNF achieve Florida’s goal that 75 percent of its waste will be recycled by 2020. The program continues to grow each year and brings focus to our society’s need to use natural resources more wisely. GoG shows students the vital connection between material use, energy consumption and its impact on the environment and is important toward our goal of graduating a generation of environmentally literate leaders. 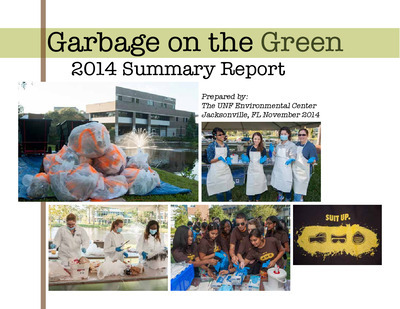 Garbage on the Green is an experiential research project in which volunteers conduct a campus waste audit. The program was developed by the Environmental Center in 2007, with support from UNF Physical Facilities. The waste audit was designed so administration could gain a better understanding of the university’s solid waste stream and make steps towards improving the overall diversion rate. 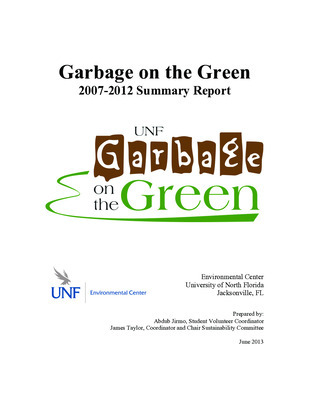 The program takes its name from ‘The Green’ a popular common space on the UNF campus where the waste audit began in 2007. 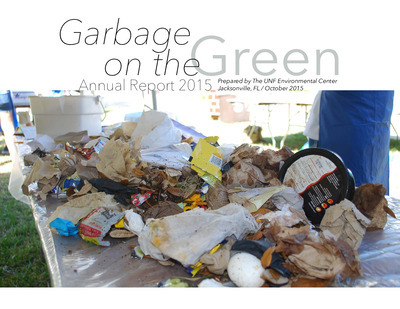 Garbage on the Green is a waste auditing pro-gram developed by the UNF Environmental Center in 2007, with support from Physical Facilities. The audit was designed to gain a better under-standing of the university’s solid waste stream and to improve the overall diversion rate. The program corresponds with UNF’s plan to reduce its overall environmental footprint. 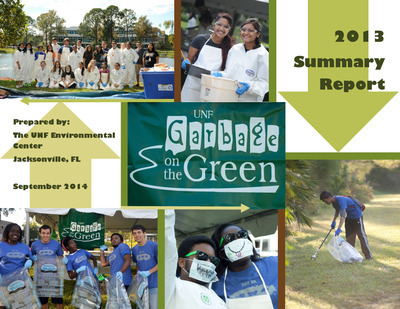 Garbage on the Green is a waste auditing program developed by the UNF Environmental Center in 2007, with support from Physical Facilities. The audit was designed to gain a better understanding of UNF’s solid waste stream and to improve the overall diversion rate. The program corresponds with UNF’s plan to reduce its overall environmental footprint. 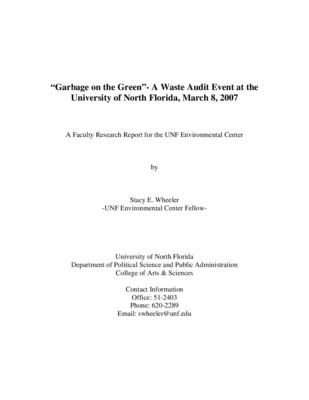 To gain a better understanding of the University’s solid waste stream, the UNF Environmental Center, with support from Physical Facilities, decided to conduct a waste audit in 2007. The program would be called ‘Garbage on the Green’, which takes its name from ‘The Green’ a popular common space on the UNF campus. The waste audit would allow Physical Facility staff to gain a better understanding of the solid waste stream and would help guide decisions to improve the University’s overall diversion rate. Garbage on the Green is an event organized to provide education and awareness of recycling practices on campus at UNF while performing a public waste audit. The purpose of the waste audit is to supply faculty and staff with a representative analysis of waste and recycling practices of representative buildings through the efforts of the Environmental Center and Physical Facilities. Students, faculty and staff are involved in the waste audit process to ensure campus community integration during the event. 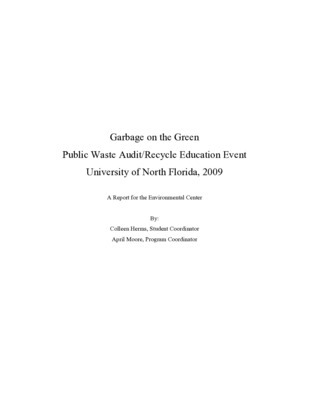 Approximately 135 undergraduate students participated in a waste characterization study at the University of North Florida (UNF) on March 8, 2007 that was titled Garbage on the Green. 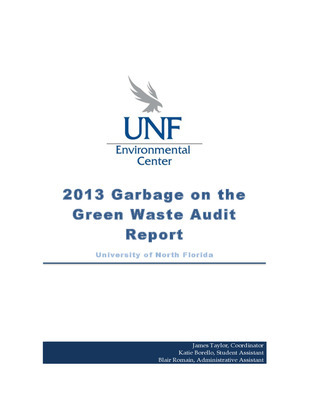 The purpose of the study was to identify and quantify the types and sources of materials in UNF’s solid waste stream. Findings from the study were used to generate new strategies for improving campus waste management and recycling programs. The study was funded by the Environmental Center and supported by the university administration, the city of Jacksonville, and a diverse group of regional public and private organizations.